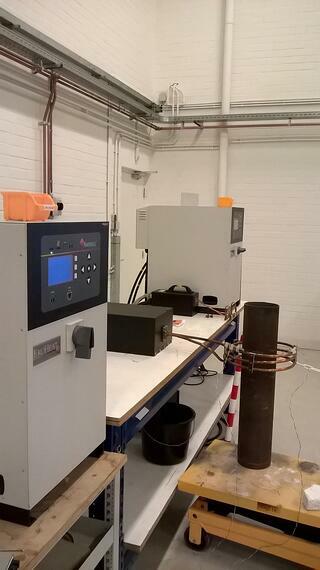 A client was already using our EKOHEAT® 50 kW induction heating system for a tube heating application. As the customer is currently expanding their production process, which requires heating of tubes of a larger diameter, the question was whether the 50 kW EKOHEAT® system would meet the objective of the application. Due to their unique architecture, EKOHEAT® power supplies offer application versatility and are suited to deliver precision heating to pieces of many shapes and sizes. With the combination of the right capacitor configuration, frequency adjustment and a unique induction coil, the EKOHEAT® 50 kW system offered homogenous heating of the larger tubes within a short time span. So, whenever you consider applying induction heating to your manufacturing or research process, empirical testing is what you need in order to determine what system will deliver the best performance in your application setting. Our team is renowned for developing innovative and effective heating solutions that produce extraordinary results. We offer complimentary testing services in THE LAB. All we need from you is the description of your process requirements. Contact us today and check out how we can help put induction heating to work for you.